Following surgery, or a prolonged amount of time in a hospital bed, it is important to reduce the risk of developing a blood clot or Deep Vein Thrombosis (DVT) due to circulatory problems. FitLegs Continued Care Below-Knee Closed-Toe Anti-Embolism Compression Stockings offers continuous care after you have been discharged from hospital and is clinically effective in reducing the risk of DVT. Who Can Use Anti-Embolism Compression Stockings? FitLegs Below-Knee Compression Stockings are ideal in preventing blood clots, ulcers, and DVT from developing following a stay in a hospital bed. Made from a comfortable material, the stockings apply pressure across the leg, allowing blood to circulate more freely. With a heal pad to increase comfort, the unique design included a loose weave across the toe, which allows for easy inspection of the skin. The anti-embolism stockings are available in teal, making them a subtle, unobtrusive addition to most outfits. It is recommended that all customers are measured by a clinician before purchasing FitLegs Continued Care Stockings. Measurements should be taken around the ankle and matched with the table below. 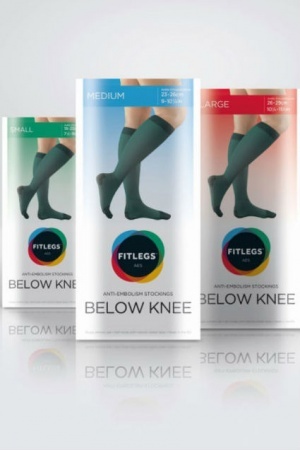 FitLegs Continued Care Below-Knee Closed-Toe Anti-Embolism Compression Stockings are non-returnable and non-refundable on grounds of hygiene.